Another couple of advices - and you'll qualify to sensei! I did not know that Nicholas 's family celebrated every year ( even in Siberia) the day of Otsu Accident as the family event. I was surprised to know it. I understood that he was seriously woonded but it seems that it was very very serious. Last week, for my work ocasion, I did read ( very quickly, I had no time) the letters from Nicky to Mama and Papa directly after the Otsu incident. I have surprised that he wrote that He did not stop to love Japan even after the incident. He also was very sorry do not able to make the fun with japanese girls (he did not say mama about it, actually)? because after the incident, he had to be on the board of the fregate almost all the time. He did not stop to love Japan even after the incident. Quite a few books here in the west claim that after the Otsu incident, Nicholas hated the Japanese, even going as far as calling them derogatory names. Some even claimed that his feeling towards Japan (which originated with the Otsu incident) was one of the causes of the Russo-Japanese War. I don't believe that the latter was the case of course. Based on what you posted that Nicholas wrote in his letter, I am wondering were his feelings of distaste about the Japanese exaggerrated, perhaps during the Japanese war, in order to awaken more patriotic feelings in the Russian people? Or is this simply something that some of the western authors have misinterpreted or even made up? Thanks! Before I read this, I also thought that he hated Japan. But he was not. He hated only policemen. I was keeping to read his letters to his mother ( with wonderful sketches sometimes) and I was surprised how lovely he said about variouse things in Japan. The war of 1904 was political matter. Russia needed the Ocean. Russia did not want to battle. I think that Nicholas classified his feelings to Japan , as to a culture, and his interest to Japan as to the War's enemy. Further, in the view of the deposition of one of the witnesses who had seen how some of the Bolsheviks had buried in the cemetery two persons, one of which was like the late ex-Emperor Nicholas II, three coffins indicated by the witness were exhumed in my presence by the order of Sergeiev, the member of the court. The bodies were so decayed as to be unrecognisable. However, Dr Derevenko, Court Physician of the Imperial Family, who took part in the Judicial and Medical examination, declared that among the exhumed bodies there was neither the ex-Emperor nor any member of the Imperial House. According to Dr Derevenko’s evidence, a callosity of the bone of the left temple, the result of a blow on the head received during a visit to Japan when the Emperor Nicholas the Second was heir apparent, could serve as a characteristic and indestructible mark of his corpse. I, like you, am wondering if there should be some kind of mark on Nicholas II's skull, the one taken out of Pig's Meadow which is labled to be the ex-Tsar's, especially, now that I read in your data that Dr Derevenko thought there should have been. If Phil and I remember correctly, sometime ago, this was discussed and someone said this mark was not on the skull found. Is there or is there not? PS I'd like to go back and read the old posts but my "search" doesn't bring up anything so I must not be using the right "key" or it's on some locked down thread. If anyone remembers where I can find the discussion, let me know, please. If Phil and I remember correctly, sometime ago, this was discussed and someone said this mark was not on the skull found. Is there or is there not? after a long search I found what you might be looking for. See this thread: http://hydrogen.pallasweb.com/cgi-bin/yabb/YaBB.cgi?board=family;action=display;num=1095331184;start=0#0 at reply # 20. Hugs for you Grand Duke and a thank you. 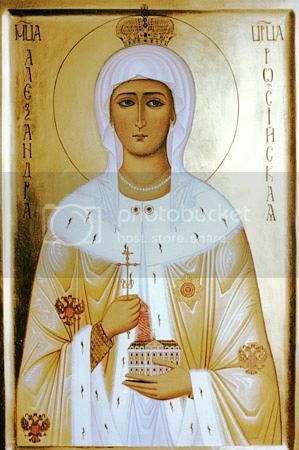 I put together two profile photos of Nicholas, from the website http://www.tzar.orthodoxy.ru/ost/exp/i_exp3.htm. From the medical reports, we know that the wounds taken in the Otsu incident were in the right side of the head, in the occipital and parietal bones (http://www.rosizo.ru/eng/japan/i/archive/17.html). 1) In the photo at the right (older Nicholas), where the arrow points, I can see in the parietal bone a long and narrow line with a different aspect from the rest of the hair. It seems brighter or with less hair. Everybody knows that when we have a scar the hair doesn`t grow in that zone. Can this line be the scar from Otsu? Or can it be just a reflection of the light? For me, it is the scar. 2) In the photo at the left (young Nicholas), where the arrow points, I can see a brighter area in the parietal bone. I can`t easily see the line I see in the right photo. Maybe the hair hides the scar. Can this brighter area be a reflection of the light? Or can it be the scar? For me, it is a reflection of the light. But with some effort (and imagination) it can also be the scar. Medical Findings of the Wound Taken by Tsarevich Nikolai Alexandrovich in Otsu. Attached to the report made by Prince Baryatinski to Emperor Alexander III. The blow was struck across the felt hat worn by the Tsarevich. The lesions sustained are as follows: The first, or occipital-parietal, wound is linear in form, measuring nine centimetres, with torn edges, and has penetrated the whole thickness of the skin down to the bone; it is situated in the area of the right parietal bone six centimetres from the upper edge of the ear, extending slightly downwards. Furthermore, vessels of the nape and temporal arteries have been cut. At the rear edge of the wound, the parietal bone has lost about a centimetre of periosteum, consistent with a blow from a sharp sabre. The second, or front parietal, wound is situated some six centimetres higher than the first and runs almost parallel, being ten centimetres in length; it has penetrated right through the skin down to the bone, and occupies the area of the parietal and part of the frontal bone. …While cleaning the second wound, I removed a wedge-shaped splinter, about two and a half centimetres long, which was in the clots of blood. Kyoto. April. 29th day 1891. State Councillor Rambakh, State Councillor V. Popov, Collegiate councillor M. Smirnov. 34 x 21 cm. ?? ? ?, ?. 677, ??. 1, ?. 701, ??. 12-13. During all the day of his coronation the Tsar Nicholas wore the enormous Russian Imperial Crown. This crown weighed nine pounds and was said to have given Nicholas II a headache since it pressed against the scar on his forehead, made by his would be Japanese assassin. 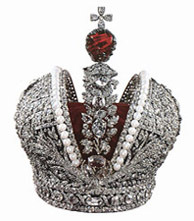 The Russian Imperial Crown of 1762, made for Catherine II's coronation. Maybe this is what I remember. It is under the thread about some tramp being buried in Nicholas II's place. According to some of the conspiracy theorists the "real" heads were taken to Moscow back in 1918, so these couldn't possibly be the "right" skulls. And I believe that they also are saying that there is no dent on Nicholas's skull and this is another piece of "evidence" they are using to say that this is not Nicholas's skull. The arguments for the rest of the remains is that the DNA was sprinkled onto the bones to make them lappear like they belong to the rest of the IF. These conspiracy guys are pretty swift - you can't pull one over on them! I'm still looking for the other serious discussion where we talked about the skull of Nicholas II. The tramp story has it's own thread and we don't need to discuss it here on this thread. 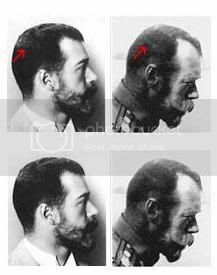 So, the question I'd like to continue here is: Did the skull of Nicholas II found in the mass grave in Pig's Meadow have a dent on the side of the skull or " a callosity of the bone of the left temple" where Nicholas II was struck with the saber? 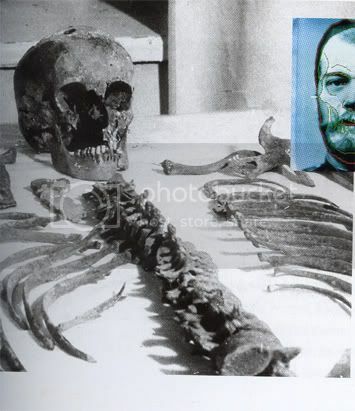 I found this on-line scientific article about the mass grave remains and it shows the skull atributed to Nicholas II and it's description: http://www3.interscience.wiley.com/cgi-bin/fulltext/77502025/PDFSTART. 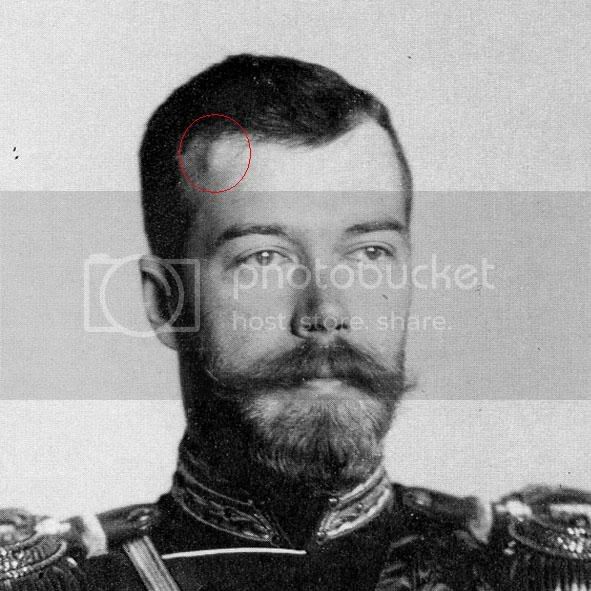 Has anyone found the answer to this question about the missing marks on Nicholas II's skull found in the mass grave? i read in Romanov: Love, Power, and Tragedy that Nicky got attacked in the head by a china man? head aces frequently, as it was stated in the book. please tell me if there is already a thread about this!